You develop sudden cold-like symptoms: stuffy nose, congestion, cough, and fever. You have trouble getting an appointment with your primary care doctor and you don't want to miss time at work by sitting in an urgent care or ER waiting room, or it is after hours and all of the urgent cares are closed. What do you do? A U.S. board-certified internal medicine doctor, family practice doctor, or pediatrician licensed in your state contacts you, reviews your history and symptoms, listens to your concerns, and asks questions. It's just like an in-person office visit. The doctor recommends the right treatment for your medical issue. If a prescription is necessary, it is sent to a local pharmacy of your choice immediately following the consultation. 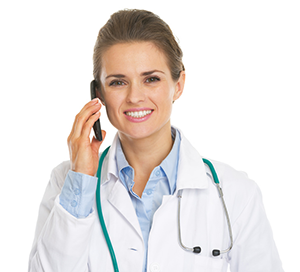 Telemedicine Physician Group charges the credit card at the end of your consultation. You can request a receipt for deductibles or reimbursement, if needed. Payment can be made with credit, debit, HSA/FSA cards, or Paypal. At the end of every call, the doctor will ask if he's answered all of your questions, and we'll always follow up within 48 hours to make sure your symptoms are improving. With your permission, we can even send a record of your encounter to your current doctor. This is only a partial list. We treat many more illnesses and injuries. Call anytime to inquire.